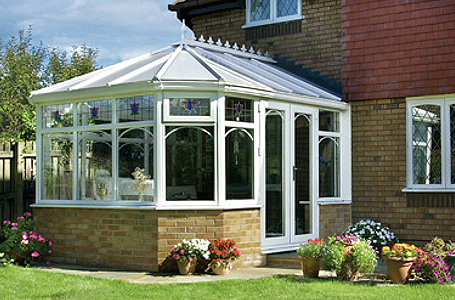 The Victorian is very versatile with its ability to complement most types of property, the Victorian is one of the most frequently seen styles of conservatory. It can be distinguished by its steeply pitched roof and its use of ornate detailing along the roof's centre apex (called the ridge). Typically, Victorian conservatories have 3 or 5 panel facets. To increase floor area the front facet can be increased in size, while the sides decreased.With the use of leadwork coloured film, attractive designs can be produced, only limited by ours (and your) imagination.